Just as Marvel led up to a group effort via 2012’s Avengers, the “DC Extended Universe” (DCEU) hit the same mark in 2017 with Justice League. However, the two franchises took different paths to their end points. Marvel began the march toward Avengers in spring 2008 with Iron Man. They then methodically introduced the other members of the team via additional films in 2008, 2010 and 2011. The DCEU debuted in 2013 with Man of Steel but then lay dormant for almost three years until 2016’s Batman v. Superman: Dawn of Justice arrived. 2016 also brought Suicide Squad and 2017 delivered Wonder Woman, though Squad boasts at most a tangential connection to Justice League. Four of six Avengers got their own movies to build toward the 2012 film, and Black Widow played a fairly prominent role in 2010’s Iron Man 2. Hawkeye popped up briefly in 2011’s Thor but didn’t receive much of an introduction prior to Avengers. On the other hand, just two of the main characters in Justice League earned substantial exposition prior to that film – and only Wonder Woman starred in her own “origin story”. Wisely, DC chose not to formally reboot Batman after the Dark Knight Trilogy, so his DCEU debut in Dawn of Justice assumes we already know the character well. As for the three other primary roles, we got fleeting teases of Cyborg, Flash and Aquaman in the earlier flicks, but they didn’t earn any clear exposition. That makes Justice League their de factor “origin film”. Which it does in an efficient manner – and it also delivers a pretty good action experience. All of this in a tighter running time than its predecessors to boot! As the world copes with the death of Superman (Henry Cavill), Batman (Ben Affleck) learns of a new threat. A malevolent ancient being named Steppenwolf (Ciarán Hinds) returns and intends to execute a plan that will result in the destruction of the Earth. Batman realizes that he can’t handle this challenge on his own, so without Superman to assist, he hunts down additional talent. Batman recruits Wonder Woman (Gal Gadot), Cyborg (Ray Fisher), the Flash (Ezra Miller) and Aquaman (Jason Momoa) to form a new alliance in an attempt to foil Steppenwolf’s plans. Going into Justice League, I assumed it’d run a minimum of 150 minutes. That’s about how long Dawn of Justice went, and both Man of Steel and Wonder Woman nudged past the 140-minute mark, so it stood to reason the “ensemble film” would use at least that span, and probably more – I easily could’ve envisioned a 160-minute Justice League. Instead, I found a film that went a brisk 120 minutes, a running time that came with its own potential perils. For one, I feared Justice League might rush through characters and narrative to such a degree that it’d become little more than a mix of action scenes with no greater depth. I also fretted that Justice League might follow the final chapters of Harry Potter and Hunger Games to give us only half a movie. I figured Justice League 2 was already planned, so I thought this film might simply tell part of the story and leave us with a cliffhanger. Happily, neither of these fears came true. Though it teases us with potential future adventures, Justice League tells a story that does wrap up at the end, and it gives us a narrative with more personality and character orientation than might’ve been the case. Though you shouldn’t expect a ton of exposition and development here, as Justice League keeps our understanding of the new participants on the skimpy side. We get rudimentary “origin tales” for Flash, Cyborg and Aquaman, but details remain minimal. This works surprisingly well. Maybe my understanding of the comic book characters filled in some dots, but I don’t feel like Justice League lacks much needed character exposition. It tells us just enough to involve us in the personalities. The film semi-wastes some supporting roles, though. As Lois Lane and Martha Kent, respectively, Amy Adams and Diane Lane exist as motivation more than as actual characters, and while JK Simmons debuts as Commissioner Gordon, he barely makes a dent. Hopefully he’ll receive more screen time in the future. As for our new heroes, Miller makes the best impression, though all seem fine. Actually, I like Momoa more than expected – he’s totally different than our normal blonde-haired frat boy vision of Aquaman, and he pulls off the shift well. In terms of narrative, Justice League delivers a surprisingly coherent plot. Concise storytelling wasn’t a strength of director Zack Snyder’s first two DCEU efforts, as both Steel and Dawn were a mess, but Justice League holds together pretty well. Though one shouldn’t anticipate a whole lot of depth there. Justice League tends to follow a pretty stiff “Point A to Point B” design – this keeps it on target in terms of purpose and development but it doesn’t allow for much real nuance or depth. Given the alternative – ie, the messiness of the prior two Snyder DCEU films – I’ll take it. 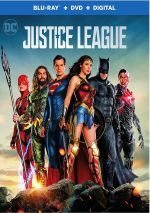 Justice League doesn’t stake out new territory for its genre or truly impress like the Dark Knight flicks did, but it brings us a lively adventure that makes me look forward to the next film. That’s more than I can say for Steel or Dawn, so color me happy. Footnote: in same tradition as the Marvel movies, Justice League boasts two bonus sequences, so stick around until the end credits close. 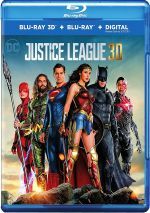 Justice League appears in an aspect ratio of approximately 1.85:1 on this Blu-ray Disc. This became a largely satisfying image. Overall sharpness worked well, with only a smattering of slightly soft dimly-lit shots on display. Most of the movie boasted positive accuracy and delineation. The image lacked jagged edges or moiré effects, and edge haloes remained absent. Print flaws also remained absent. Unsurprisingly, the film’s palette favored a notable orange and teal hint, though some segments favored a pretty desaturated feel, and the apocalyptic climax pushed toward reds. The disc replicated the colors as intended. Blacks seemed dark and dense, but shadows could seem a little murky, as low-light shots weren’t quite as smooth as I’d like. Still, I felt happy with the transfer in general and thought it offered a good representation of the film. Downconverted to Dolby TrueHD 7.1, the movie’s Dolby Atmos audio added great dimensionality to the effort. With many action scenes, the mix used the various channels to create a lively, vivid soundscape. This meant various vehicles zipped around the room in a smooth, convincing manner, while other aspects of battles and mayhem brought out well-placed material that blended together in a nicely integrated way. The soundfield meshed together to deliver a well-rounded impression. Audio quality also impressed, with speech that seemed natural and concise. Music appeared vivid and full, with dynamic tones. Effects fared best of all, as those elements seemed accurate and tight, with crisp highs and deep lows. As I expect from a movie of this sort, the soundtrack excelled. When we shift to extras, we find a slew of featurettes, and these begin with the 14-minute, 10-second Road to Justice. 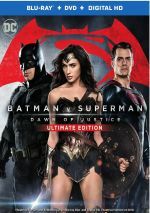 It offers comments from animation producer Bruce Timm, DC co-publishers Jim Lee and Dan DiDio, producers Deborah Snyder, Charles Roven and Geoff Johns, comics writers Marv Wolfman and Grant Morrison and actors Ray Fisher, Henry Cavill, Ben Affleck and Ezra Miller. “Road” follows the origins and development of the Justice League, with tangents about various TV adaptations. It delivers a short but tight history. 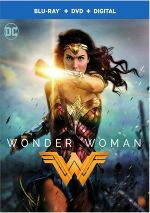 With Heart of Justice, we find an 11-minute, 52-second reel with notes from Johns, Roven, Snyder, Affleck, Lee, Miller, Cavill, executive producers Wesley Coller and Curtis Kanemoto, and actors Gal Gadot, Amy Adams and JK Simmons. “Heart” gives us notes about Batman, Wonder Woman and Superman, the core of the Justice League. We get a smattering of decent notes but not much depth. Next comes Technology of the Justice League, an eight-minute, 14-second piece with Miller, Fisher, production designer Patrick Tatopoulos, set decorator Dominic Capon, visual effects supervisors Tom Proctor and Bryan Hirota, and costume designer Michael Wilkinson. As implied by the title, this show looks at vehicles, costumes and other gadgets/gizmos featured in the film. “Technology” brings us an efficient effort. 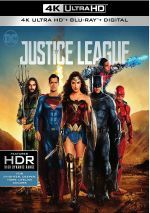 Justice League: The New Heroes goes for 12 minutes, 24 seconds and features Fisher, Roven, Wolfman, Johns, Coller, Miller, and actor Jason Momoa. “Heroes” covers elements related to Cyborg, Aquaman and Flash. It’s another fairly informative piece. The villain comes to the fore with Steppenwolf the Conqueror, a three-minute, three-second featurette that includes Johns, DiDio, Lee, and actor Ciaran Hinds. We learn a little about the film’s villain – too little, as this becomes a show that should run a bit longer. Costumes become the focus of Suit Up: The Look of the League. It lasts 10 minutes, 21 seconds and brings remarks from Wilkinson, Affleck, Momoa, Gadot, Fisher, Proctor, Cavill, and Miller. Dominated by Wilkinson, this offers a solid take on the superhero outfits in the film. Four Scene Studies occupy a total of 15 minutes, 16 seconds. We see “Revisiting the Amazons” (3:32), “Wonder Woman’s Rescue” (3:14), “Heroes Park” (4:48) and “The Tunnel Battle” (3:32). Across these, we hear from Tatopoulos, Wilkinson, Cavill, Hirota, Affleck, Adams, stunt performers Hayley Warnes and Jolie Stanford, stunt coordinator Eunice Huthart, location manager Matt Clarke, supervising location manager Amanda Stevens, fight choreographer Freddy Bouciegues, digital effects supervisor Harry Mukhopadhyay, visual effects leads Chris Mulcaster and Josiah Holmes Howison, and actors Samantha Jo, Hari James, Brooke Ence, and Michael McElhatton. The clips look at stunts, effects, locations and related areas, as they offer useful material about the various production elements. In terms of deleted scenes, we find The Return of Superman, a two-minute, four-second pair of clips that boast “footage not seen in theaters”. Don’t expect much, as we just get a few minor shots of Supes that add little. The disc opens with an ad for Justice League VR. No trailer for Justice League appears here. After prior misfires, DC Comics bounced back in 2017 via Wonder Woman and Justice League. The latter didn’t find as big an audience as expected, but I think it delivers a brisk, fun superhero adventure. The Blu-ray brings us largely positive picture as well as excellent audio and a serviceable set of supplements. This develops into a pretty enjoyable tale.